پژوهش پیش‌رو با هدف معرفی مدل همسان‌سازی داده‌های زمینی و ارزیابی دقت داده‌های این مدلدر مقابل داده‌های اندازه‌گیری شده ایستگاه‌های همدیدی سطح کشور به انجام رسیده است. مدل همسان‌سازی داده‌های زمینی بطور مشترک توسط مراکز ناسا و نوآ با هدف شبیه‌سازی دقیق متغیرهای جریان و شرایط چرخه آب و انرژی توسعه داده شد. پوشش جهانی، قدرت تفکیک مکانی و زمانی بالا به‌همراه سیستم مدلسازی ترکیبی داده‌های سنجش از دوری و مشاهدات زمینی از ویژگی‌های منحصر بفرد این مدل است. این مدل متغیر‌های سیستم جو - زمین را در مقیاس‌های زمانی ماهانه و 3 ساعته با قدرت تفکیک مکانی 1 و 25/0 درجه جغرافیایی برآورد می‌کند، که خروجی آن نتیجه شبیه سازی چهار مدل سطحی Mosaic،Noah،CLMو VICمی‌باشد. برای ارزیابی مدل GLDAS،داده‌های متوسط دمای ماهانه 66 ایستگاه همدیدی با پراکنش مناسب در سطح ایران و نیز داده‌های مدل GLDASبا دقت مکانی 25/0×25/0 درجه جغرافیایی از سایت‌های مربوطه دریافت و پردازش شد. برای ارزیابی آماری داده‌های نام برده از آماره‌های ضریب تعیین(2r)، مجذور میانگین مربع خطا (Rmse)، شیب خط(Slope)، اریب(Bias) و ضریب کارایی مدل(EF) استفاده شد. مقایسه‌های آماری انجام شده نشان داد که داده‌های این مدل در سطح ایران از دقت بسیار مناسبی برخوردار می‌باشد و میزان خطای این مدل در برآورد متوسط دمای ایستگاه‌های مورد بررسی بسیار اندک و قابل چشم‌پوشی است. با وجود این در برخی مناطق بویژه درایستگاه‌های شمالی کشور مقدار برآورد مدل بیشتر از مقدار مشاهده‌ای و درتعداد محدودی از ایستگاه‌ها مانند کاشان و سنندج کمتر از مقدار مشاهده‌ای برآورد شده است. با توجه به پوشش جهانی، متغیرهای زیاد اقلیم - هیدرولوژی و نتایج این تحقیق که بیانگر دقت مناسب برآوردهای مدل جهانی همسان سازی داده‌های سطح زمین در پهنه ایران است، پیشنهاد می‌شود دقت متغیرهای دیگر این مدل نیز برای مناطق مختلف ایران مورد ارزیابی و واسنجی قرار گیرد. The limited access to the atmospheric and terrestrial data such as rainfall, temperature, humidity and soil temperature is the most important problem in studying many climatological and hydrological in many parts of the world, particularly in developing countries, rural and mountainous areas. One of the solutions to overcome this obstacle is to use available gridded datasets that have proved their representativeness for many different parts of the world. Although the use of satellite data and gridded datasets is a reasonable alternative source for areas lacking station and data, since local effects can vary from region to region and can affect satellite and model performance, thus an dataset must be evaluated in a region before it is used as a decision-making tool in that region. The present study is aimed at the presentation of Global Land Data Assimilation System (GLDAS) and evaluates this model dataset against data measured by synoptic stations. The Global Land Data Assimilation System (GLDAS) has been developed jointly by scientists at the National Aeronautics and Space Administration (NASA) Goddard Space Flight Center (GSFC) and the National Oceanic and Atmospheric Administration (NOAA) National Centers for Environmental Prediction (NCEP) in order to produce such fields. The goal of a land data assimilation system is to ingest satellite and ground-based observational data products, using advanced land surface modelling and data assimilation techniques. The uniqueness of GLDAS is that it is a global, high resolution, offline terrestrial modelling system incorporating ground and satellite observations. The temporal resolution for the GLDAS products is 3-hourly and Monthly with 0.25 and 1 degree spatial resolution its output is the result of four land surface models: the Community Land Model (CLM), NOAH, Mosaic, and the Variable Infiltration Capacity (VIC) model.The products are in Gridded Binary (GRIB) format and can be accessed through a number of interfaces. The representativeness and performance of GLDAS in estimate temperature amount at 66 Iranian synoptic stations distributed across the country is herein examined. To evaluate the performance of the considered dataset when compared to the observed temperature records at the considered locations we have used R squared, the Nash–Sutcliffe model efficiency coefficient (EF), RMSE, Bias, B slope of the regression and the standardized RMSE indicators. The performance of the dataset was also graphically represented through scatter plots of the established regression between GLDAS and observation at the selected stations. The results of the statistical indicators were represented through plotting the indicators over the map of Iran to ease displaying spatial tendency of the indicators and explaining the possible geographical role in controlling the spatial variation of the indicators. According to the results of the evaluation, the GLDAS data performs well in all of the studied stations with strong correlation coefficient. However, the Special physiographic and climatic characteristics is one of the main reasons for this overestimation in the coastal areas of the Caspian Sea. very likely due to not properly taking into account the complex topography of the region in its model parameterization or not being able to remove the effect of sea atmosphere in the stations nearby the seas. However, since the cloud of the estimated data for this region are distributed along the regression line, it can be said that the observed over-estimation could be resolved through establishing a statistical relationship between the observed and modeled datasets; thus such a mismatch might not be considered as a drawback of the modeled dataset. Considering that this model output is produced through combination of the modeled, observed and remotely sensed data, it could be confidentially used for mountainous areas and deserts of Iran that suffer from lack of weather stations or substantial missing values. This data-set might be considered as a superior dataset to be used for many climatological and hydrological subjects in Iran and thus should be seen as a promising tool for extending hydrological and climatological research areas in the country. Statistical comparisons indicate that the GLDAS data perform well in all of the studied stations with strong Accuracy. Due to the Global coverage of the model dataset, A large number of climate-hydrological variables, and the results of this research that indicate the Good accuracy of the GLDAS model in Iran, It is suggested that all variables in the model to be evaluated. 1- پاکدل خسمخی، طاهری تیزرو، معروفی، وظیفه‌دوست؛ حدیث، عبدالله، صفر، مجید؛ 1393؛ ارزیابی محصول بارش و رواناب از سیستم جهانی همگون‌سازی داده‌های زمینی GLDAS، در حوضه پلرود، دومین همایش ملی مهندسی و مدیریت کشاورزی و محیط زیست و منابع طبیعی پایدار، تهران مرکز همایش‌های بین‌المللی دانشگاه شهید بهشتی. 2- صفری، شریفی، باقری، توکلی؛ عبدالرضا، محمدعلی، حمیدرضا، یحیی؛ 1392؛ پالایش داده‌های پتانسیلی گریس (GRACE) برای تعیین تغییرات میدان گرانی با استفاده از روش پایدارسازی تیخونوف تعمیم یافته در زیر فضای سوبولف، مجله فیزیک زمین، دوره 39، صص. 77-51. 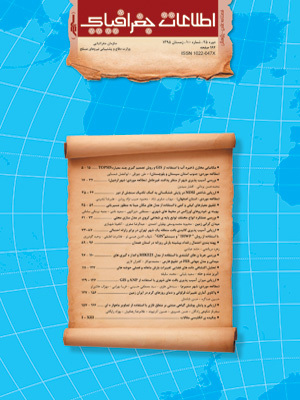 3- عساکره، حسین، 1390، اقلیم شناسی آماری، انتشارات دانشگاه اصفهان. 4- فرجی، وظیفه‌دوست، شکیبا،کاویانی؛ زهره، مجید، علیرضا، عباس؛ 1393؛ ارزیابی اجزای بیلان آب سطحی در مناطق فاقد آمار با استفاده از مدل جهانی سطح زمینGLDAS (مطالعه موردی: دشت نیشابور، خراسان رضوی)، دومین همایش ملی بحران آب، دانشگاه شهرکرد. 5 - Benjamin, F.Z., Matthew, R., and Francisco, O., 2010, Evaluation of the Global Land Data Assimilation System using global river discharge data and a source to sink routing scheme, Water Resources Research,46, W06507, doi:10.1029/2009WR007811. 6 - Berg, A. A., Famiglietti,J. S., Rodell,M., Reichle, R. H., Jambor,U., Holl, S. L., and Houser,P. R., 2005, Development of a hydrometeorological forcing data set for global soil moisture estimation, International Journal of Climatology, Vol.25, pp.1697–1714. 7 - Du, J.P., Sun,R., 2012, Estimation of evapotranspiration for ungauged areas using MODIS measurements and GLDAS data,Procedia Environmental Sciences, Vol. 8, pp. 1718 – 1727. 8 - Fang, H., Beaudoing, H.K., Rodell, M., Teng, W.L., and Vollmer, B.E., 2009, Global Land Data Assimilation System (GLDAS) Products, Services and Application from. NASA Hydrology Data and Information Services Center (HDISC), ASPRS 2009 Annual Conference Baltimore, Maryland - March 8-13. 9 - Feng, S., and Fu, Q., 2013, Expansion of global drylands under a warming climate, Atmospheric Chemistry and Physics, Vol.13, pp. 81-94. 10- Gairola, R.M., Prakash, S., Pal, P.K., 2015, Improved rainfall estimation over the Indian monsoon region by synergistic use of Kalpana-1 and rain gauge data, Atmospheric sciences, Vol.28, pp. 51-61. 11- Ji, L., Senay, G.B., and Verdin, J.P., 2015, valuation of the Global Land Data Assimilation System(GLDAS) air temperature data products, Journal of Hydrometeorology, doi: http://dx.doi.org/10.1175/JHM-D-14-0230.1. 12- Kim, S, and Brubaker, L, 2014, Comparison of gauge and MPE precipitation data for the Chesapeake Bay Watershed Model, Journal of Hydrologic Engineering, Vol. 19, pp. 1042–1047. 13 - Liang, X., D. P. Lettenmaier, E. F. Wood, and S. J. Burges, 1994, A simple hydrologically based model of land surface water and energy fluxes for GSMs, Journal of Geophysical Research, Vol. 99 (7), pp. 415–428. 14- Liu, Y. Y., M.F. McCabe, J.P. Evans, A.I.J.M. Van Dijk, R.A.M. de Jeu and H. Su., 2009, Comparison of soil moisture in GLDAS model simulations and satellite observations over the Murray Darling Basin, Newham (eds) 18th World IMACS Congress and MODSIM09International Congress on Modelling and Simulation, 2798-2804. ISBN: 978-0-9758400-7-8. 15- Mishra, A.K., Gairola, R.M., Varma, A.K., Agarwal, V.K., 2011, Improved rainfall estimation over the Indian region using satellite infrared technique, Advances in Space Research, Vol. 48, pp. 49–55. 16 - Park, J., and Choi, M., 2015, Estimation of evapotranspiration from ground-based meteorological data and global land data assimilation system (GLDAS), Stochastic Environmental Research and Risk Assessment, Vol 29, pp. 1963-1992. 17 - Qi, W., Zhang,C., Fu,G. T., Sweetapple,C., and H. C. Zhou., 2015, Evaluation of global fine-resolution precipitation products and their uncertainty quantification in ensemble discharge simulations, Hydrology and Earth System Sciences, doi:10.5194/hessd-12-9337. 18 - Raziei, T., Pereira, L.S., 2013, Spatial variability analysis of reference evapotranspiration in Iran utilizing fine resolution gridded datasets, Agricultural Water Management, Vol. 126, pp.104–118. 19- Rodell, M., P. R. Houser, U. Jambor, J. Gottschalck, K. Mitchell, C.-J. Meng, K. Arsenault, B. Cosgrove, J. Radakovich, M. Bosilovich, J. K. Entin, J. P. Walker, D. Lohmann, and D. Toll, 2004. The Global Land Data Assimilation System, Bulletin of the American Meteorological Society, Vol. 85(3), pp. 381-394. 20- Rui, H., and Beaudoing, H., 2015. Global Land Data Assimilation System Version 2 (GLDAS-2) Products, Last revised, National Aeronautices and space administration. 21 - Rui, H., Beaudoing, H., Mako, D.M., Rodell, M., Teng, W.L., and Vollmer, B., 2010, New and Improved GLDAS and NLDAS data sets and data services at HDISC/NASA, American Geophysical Union, Fall Meeting 2010. 22- Seyyedi, H., Beighley,E., McCollum, J., and E. Anagnostou., 2013, Hydrologic Evaluation of TRMM-3B42 and GLDAS-CLM Precipitation Products over a Mid-size Basin, 27th Conference on Hydrology. 23- Seyyedi,H., Anagnostou, E.N., Beighley,V., and McCollum, J., 2014, Satellite-driven downscaling of global reanalysis precipitation products for hydrological applications, Hydrology and Earth System Sciences, Vol. 18, pp. 5077–5091. 24 - Spennemann, P.C., Rivera, J.A., Saulo, A.C., Penalba, O.C., 2015. A Comparison of GLDAS Soil Moisture Anomalies against Standardized Precipitation Index and Multisatellite Estimations over South America, Journal of Hydrometeorology, Vol. 16(1), pp.158-171. 25 - Tarruella, R., and Jorge, j., 2003, comparison of three infrared satellite techniques to estimate accumulated rainfall over the iberian peninsula, International Journal of Climatology, Vol. 23, pp.1757–1769. 26 - Wagner, P. D., Finer, P., Wilken, F., Kumar, SH., Schneider, K., 2012, Comparison and evaluation of spatial interpolation schemes for daily rainfall in data scarce regions, Journal of Hydrology, Vol. 464, pp.388 – 400. 27 - Xiao, R., He, X., Zhang, Y., Ferreira, V.G., and Chang, L., 2015, Monitoring Groundwater Variations from Satellite Gravimetry and Hydrological Models: A Comparison with in-situ Measurements in the Mid-Atlantic Region of the United, Remote Sensing, Vol. 7, pp.686-703; doi:10.3390/rs70100686. 28 - Zawadzki, J., and Kdzior, M.A., 2014, Statistical analysis of soil moisture content changes in Central Europe using GLDAS database over three past decades, Central European Journal of Geosciences, Vol. 6, Issue 3, pp.344-353.